There is a buzz in the market concerning investment in SIPs. Let’s see what benefits one can get with it. The much tricky factor lies in choosing an instrument which one can trust through thick and thin. SIP is one such product where all you need to do is pick a mutual fund scheme as per your investment objective, set up your investment, and relax; as here you don’t have to keep track of the market cycles. There are several benefits that you can accrue with your investment via SIP. Let’s find out more about them. This is a unique benefit of SIP, i.e., averaging. To proceed, here’s how averaging works. 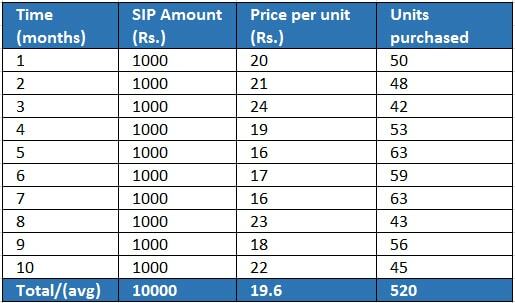 According to the table, you will be able to purchase a total of 520 units at the end of the ten months through the way of SIP. On the other hand, if you would have invested through a lump sum, then you would have got to purchase only 500 units (1000*10/20). Here, you get the benefit of having 20 extra units. This shows, with regular investment in a suitable SIP plan, you can average out the cost of investment, thus buy more units when the fund’s NAV is low and vice versa. This effect is commonly referred to as Rupee-cost averaging, and it makes any time a good time to invest via SIP as it reduces your exposure to market fluctuation. SIP has come up with different variants including Flexi-SIP and Step-up SIP. They provide a unique source of investment to prudent investors who believe in the theory that with an increase in income, there should be an increase in savings and investments too along with the expenditures. When choosing a Flexi-SIP option, you can increase or decrease the amount of SIP that you invest in a regular way depending on your or your advisor’s take on the markets. In the case of Step-up SIP, you can steadily choose to increase your SIP amount, in-line with an increase in your income. Compounding can be compared with a multiplier effect. Here, the interest that is earned by the initial capital also earns an interest; thus the investment value grows at a geometric rate rather than an arithmetic rate. Let’s understand the concept via an example. ** The future values shown in the above table are shown by taking the expected growth rate of 15%. In the table, the figures are shown on the basis of the investment of Rs. 2000 monthly in SIP. When you continue to invest till the first five years, the total value of your investment grows to Rs. 1,20,000 and the future value stands around Rs. 1,79,363 (expected rate of return of 15%). If you stay invested for another five years, then the benefits that you gain will be more than what you earned in the first five years. Similarly, each extra five years that you stay invested allows you to reap superior benefits to what you have earned in the previous tenure. The results are indeed eye-popping. This is the Power of Compounding, the eighth wonder of the world. Have you ever felt disappointed with the fact that you’re not born with a silver spoon? Well, if you did, then it’s time to make sure that you don’t let your children feel the same way. With SIP investment, you need a handful of pennies to assure that you’ll become a crorepati some day. Just with a minimum amount of Rs. 500 and regular investment in SIP, you can plan all your life’s objectives. Through the example mentioned above, you have seen how small investment in SIP can help you create a significant amount due to the effect of compounding. Using the same case, you too can set a goal for yourself and in baby steps, by making small investments, reach that goal. For an investor’s ease, there are SIP calculators present online, where you need to add an amount that you can invest in fixed time intervals and calculate the amount you can make in a set tenure as per your need. We hope after going through all these points, you must be planning to make your next investment in SIP. Considering this, don’t forget to take a personalized recommendation on the category of mutual fund that suits your investment objective. Reach out to us at MySIPonline, and we will proffer you with all the knowledge and assistance that you need in this context.